After collecting lunch (children bring a nut free lunch from home) and washing up in the transition period, each child has time to eat lunch in a relaxed manner with teachers and peers. When finished each child clears his or her space and moves to the carpet to begin a quiet book time while teachers help individual children with tooth brushing. During the rest time that follows, a relaxing mood is set through quiet voices, low lights, relaxation exercises, and individual cots for each child. Those children who are unable to sleep are encouraged to continue to quietly look at books. After a rest, children help put personal items and cots away, and join a planning meeting. Teachers introduce a topic and/or project at this meeting, generating conversations among the children around a common theme. Children discuss afternoon plans and choices with teachers in order to plan for their afternoon time. Children begin the activity period with activities and/or projects that follow up from the meeting discussion. 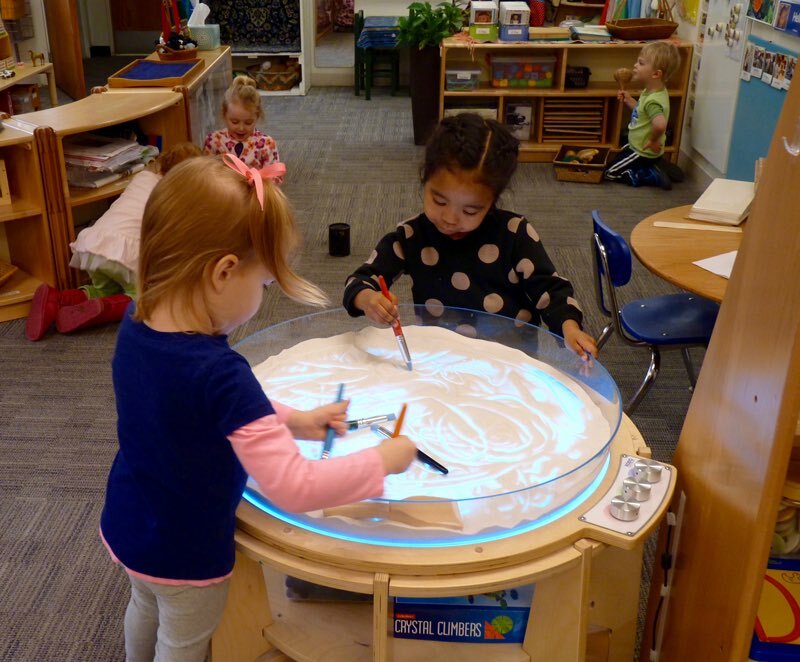 If time allows, children explore other centers and materials in the classroom freely. The play period ends with a group clean up and preparation for outdoor play. After about 30 minutes outdoors (depending on the weather it may be shorter or longer), children return to the classroom for a goodbye meeting. Children gather on the carpet to relax and share conversations as they wait for their pickup person to arrive. 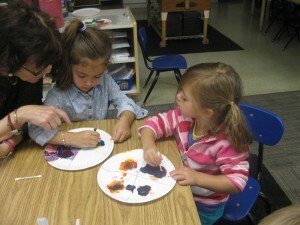 Children participate in both open-ended and teacher initiated projects using a variety of media including clays and other modeling materials, diverse collage materials, printing and painting. Teachers may introduce artist studies, when the work and techniques used by specific artists using varied media and in book illustrations stimulate processes and ideas for the children’s projects. 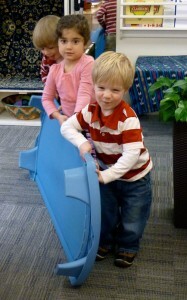 Children participate in activities that encourage language, storytelling, drama, and pretend. Often, high quality children’s literature offers a beginning, as children retell a story, create props to act out a familiar tale, or use puppets. 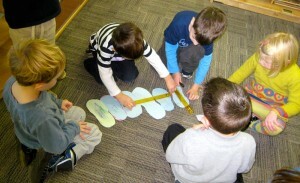 Children may create their own individual or collaborative stories as well. 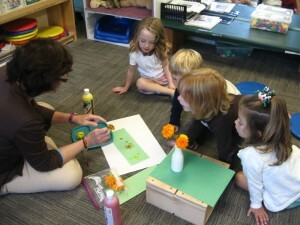 Teachers reserve time and offer props for varied pretend play, and join children as they define roles and develop plans for play. 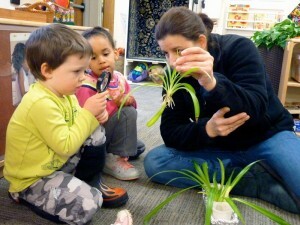 Children participate in both open-ended and teacher initiated projects, discussions, and experiments that encourage observation, predictions, the collection of data, and simple documentation. The relationship between the arts and science are emphasized as children create patterns, think about shape, color, or texture. In addition, open-ended materials that support mathematical and scientific thinking (for example, unifix, pattern or other blocks, ramp systems, measurement and water play) are available for free exploration. Children participate in small group music times that feature rhythmic play, exploration of sound patterns and simple improvisation, singing, and participation in circle and other singing/musical games and dances. 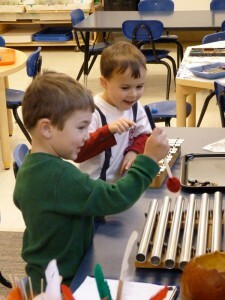 Children explore a variety of diverse instruments, and may make their own from found materials. High quality children’s literature offers a beginning, as children use books with songs, or use instruments and body sounds to create sound effects as they retell and dramatize a familiar story. Children participate in both open-ended and teacher initiated projects and discussions that encourage language development, letter and word sound play, alphabet knowledge, enjoying books and stories, beginning writing, and creating collaborative books and stories. Embedding literacy experiences in playful activities and projects is emphasized, so that skills are developed for a purpose that is meaningful to the children, and so that children better understand why reading and writing are powerful communication tools. In addition, open-ended materials that support literacy (for example, picture and other books, sensory alphabet cards or stones, open-ended writing tools) are available for free exploration.